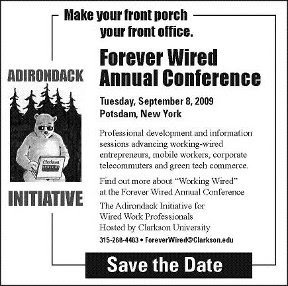 I am pleased to see the press coverage Clarkson University’s upcoming conference “Forever Wired” is receiving. It has been ten years since I wrote the white paper, “Teledevelopment in the Adirondack North Country; Capitalizing on the New Economy,” and unfortunately, we haven’t capitalized enough on the New Economy here in the Adirondacks. Lately however, it appears the message is getting out: comprehensive broadband access in the Adirondacks is not a luxury, it is a necessity. It is the norm now, according to Julie West, Executive Director of CBN Connect; a not-for-profit group formed to be a wholesale "carrier's carrier." CBN Connect intends to provide open services broadband transport throughout the Clinton, Essex and Franklin Tri-County region of New York State. Without it, says West, this region will be left behind. Towns will dry up. Even farmers need broadband access. 24/7 access to high speed internet services is an essential aspect of both my professional and personal lives. I was one of the early “telecommuters” based in the Adirondacks. We tried to influence public policy but early adopters are usually a small group and considered a little fringe, so success ten years ago was limited. The primary challenge in those days was our sparse population made it unprofitable for private communication companies to invest their dollars in infrastructure. The ROI simply wasn’t there. That continues to be the case. As I‘ve mentioned a number of times, the Adirondacks are a lovely place to live and play partly because of the lack of masses of people stuffed into one place. A lack of people means a lack of customers, as the telecomm companies know. The double-edged sword cuts both ways! Sparse population makes it nice here, but it is the very reason we have reduced access to services. (Shopping!?) Since internet access has now become as essential as electricity, two key constituents in the discussion; public policy makers and academics, are now on the case. Kudos! Although there is a great deal of work to do, the positive potential is massive.